Take 7 capsules with one to cups of any high glycemic (high sugar), low acid juice or beverage. Creatine Monohydrate is a precursor to the bioenergetic fuel, CreatinePhosphate (CP). In muscle, CreatinePhosphate replenishes cellular ATP levels during maximum intensity contractions. 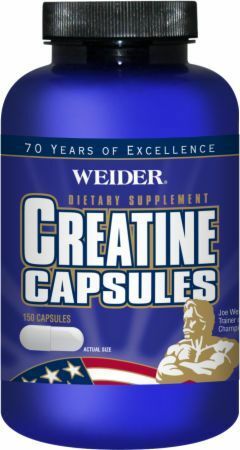 * Supplementation with Weider Creatine Capsules, as directed, contributes to increased muscle CreatinePhosphate levels, more work output, more muscular power, better recovery and muscle hydration. * When muscles are hydrated, muscle catabolism (breakdown) is minimized.